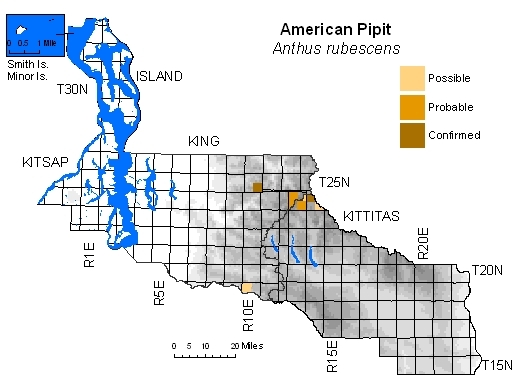 Washington Gap report (Smith et al. 1997) maps predicted breeding range at very high elevations on both sides of Cascade crest north of Snoqualmie Pass and in western Wenatchee Mountains. Most records during BBA period came from this area, but one "possible" record from Huckleberry Mountain (elevation 4,600 feet) in southeastern King County hints at wider distribution. 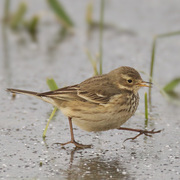 American Pipits prefer moist habitats with well-developed alpine vegetation. Remoteness and difficulty of terrain precluded extensive atlas work in alpine zone along much of crest.